Emilio Walls enjoys pushing his limits. The senior biology major has made the most of his time at UT Martin both inside and outside the classroom through active campus organizations, rigorous classroom experiences and opportunities to job shadow local professionals. "I wanted to reach my full potential, so I switched (my major) to biology because I heard how hard the classes are, and in order to reach my full potential I needed to do something that would push me to my limits," he said. After graduating from UT Martin this spring, Walls plans to pursue a master's degree in public health with a concentration in epidemiology. He will also fulfill an active-duty commission as a second lieutenant in the U.S. Army. Walls is used to juggling responsibilities, though, and has served in a variety of positions during his undergraduate years. 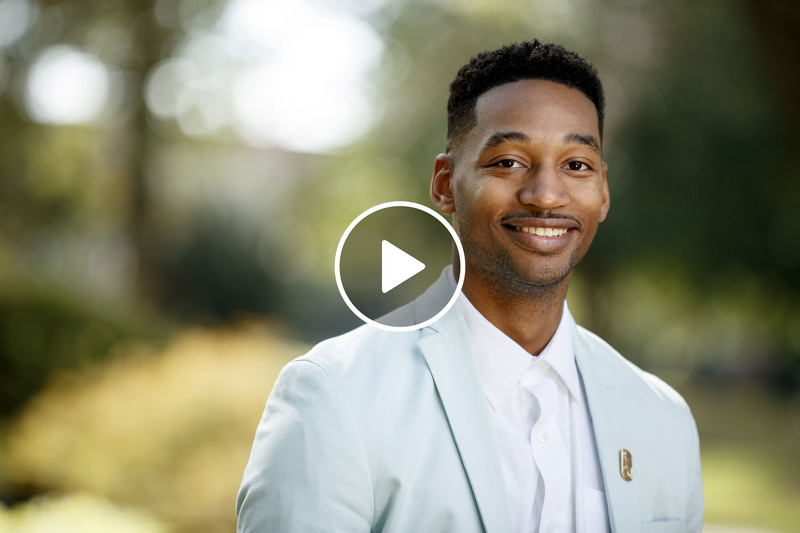 He is a member of the Black Student Association and the Student Government Association, a cadet in the Reserve Officers Training Corps, a member of the Alpha Phi Omega fraternity and a resident assistant in the UT Martin Office of Housing. "I think being a part of many organizations … allows students to gain a network they may need after college. You never know where you may end up," he said. In addition to his on-campus connections, Walls' network includes the local physicians he has shadowed in an effort to choose his future medical specialty. "At first I really didn't know what specialty I wanted to have in medicine, but shadowing a family physician really opened my eyes," he said. "I'd had my heart set on being a family physician, but once I shadowed a family physician, it wasn't really interesting to me. So then I shadowed a gastroenterologist who deals with the internal side of medicine, and that helped me realize what I really want to do." His network also includes prominent speakers and performers he has met through the UT Martin Civil Rights Conference, an annual event held on the main campus each February. Walls is on the planning committee for the 2018 conference and was able to meet many of the primary speakers, including political activist Kwame Rose, during the 2017 event. When asked what advice he may have for incoming students, Walls hopes to remind students to manage their time well and remember to push through any difficulties they may face. "You've got to apply pressure from here on out," he said. "You've got to just get back to work. It will pay off in the end."